I am transitioning to ATR Computational Neuroscience Lab in Kyoto, Japan. My new webpage is here. Guilherme is a research scientist at the Intelligent Autonomous Systems group (IAS) in TU Darmstadt since November 2013. 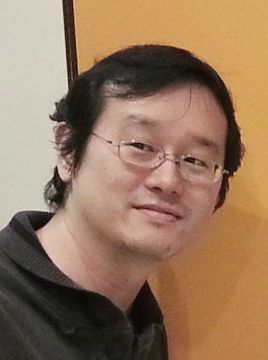 He is the IAS team leader for the 3rdHandRobot Project (below you will find some recent videos related to the project). His goal is to enable robots to learn challenging tasks by interacting with humans and with the environment. To this end, his research bridges the areas of control, learning, and human-robot collaboration. Guilherme received his PhD from the Australian Centre for Field Robotics (ACFR). He did his work under the supervision of Hugh Durrant-Whyte, Surya Singh, David Rye, and Ian Manchester. Motivated by the mining industry, his work investigated the combined use of data-driven iterative learning methods and state estimation applied to autonomous excavators. His thesis is available here. Between 2005-2007 he did his masters at the Tokyo Institute of Technology (TITECH) in the field of precision positioning control. Guilherme also worked from 2007 to 2009 at IHI Corporation researching novel mechanical designs and control methods for heavy industrial equipment such as industrial end-effectors and large-scale roller printers. Our paper "Active Incremental Learning of Robot Movement Primitives" has been accepted at the 1st Annual Conference on Robot Learning (CoRL 2017). I am giving two talks at the IROS 2017 workshops. Human in-the-loop robotic manipulation: on the influence of the human role on the 24th of September, and Shared Autonomy. Joint Learning in Human-Robot Collaboration. on the 28th. Robots that can be programmed by non-technical users must be capable of learning new tasks incrementally, via demonstrations. This poses the problem of selecting when to teach a new robot skill, or when to generalize a skill based on the current robot's repertoire. Ideally, robots should actively make such decisions, rather than the human. If a robot can quantify the suitability of its own skill set for a given query, it can decide whether it is confident enough to execute the task by itself, or if it should request a human for demonstration. We are currently investigating algorithms for active requests for incremental learning of reaching skills via human demonstrations. Gaussian processes are used to extrapolate the current skill set with confidence margins, which are then encoded as movement primitives to accurately reach the desired query in the workspace of the robot. This combination allows the robot to generalize its primitives using as few as a single demonstration. In the video you can see a robot indicating to the user which demonstrations should be provided to increase its repertoire of skills. The experiment also shows that the robot becomes confident in reaching objects for whose demonstrations were never provided, by incrementally learning from the neighboring demonstrations. Imitation learning is useful to endow robots with skills that are difficult, if not impossible, to program by hand. For example, a golf swing movement that exploits the redundancy of a 7 degree-of-freedom arm, or a collaborative skill that must be coordinated with the movement of a human partner. Kinesthetic teaching and teleoperation are now widely accepted methods to provide demonstrations for imitation learning, mainly because they avoid the correspondence problem. However, these methods are still far from ideal. In human-robot collaboration, kinesthetic teaching is disruptive and natural interactions cannot be demonstrated. When learning skills, the physical embodiment of the robot obstructs truly optimal and natural human demonstrations. Ideally, robots should learn simply by observing the human. Direct observations pose the problem that a movement that can be demonstrated well by a human may not be kinematically feasible for robot reproduction. In this paper we address this problem by using stochastic search to both find the appropriate location of the demonstration reference frame w.r.t the robot, and to adapt the demonstrated trajectory, simultaneously. This means that a human demonstrator can show the skill anywhere without worrying if the robot is capable or not of reproducing it kinematically. Our optimizer aims at finding a feasible mapping for the robot such that its movement resembles the original human demonstration. 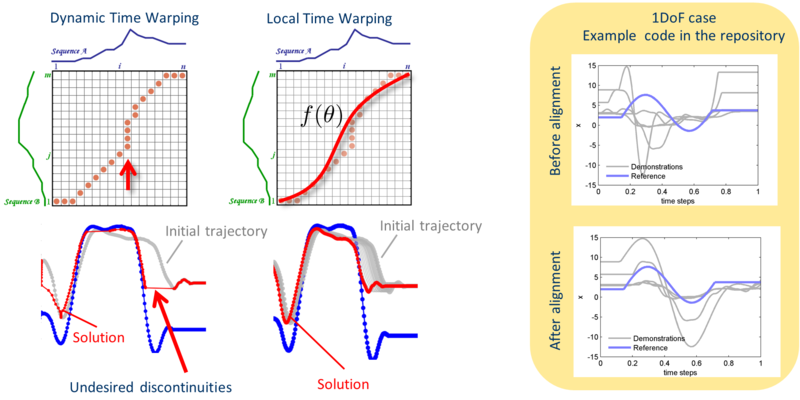 While probabilistic models are useful to classify and infer trajectories, a common problem is that their construction usually requires the time alignment of training data such that spatial correlations can be properly captured. In a single-agent robot case this is usually not a problem as robots move in a controlled manner. However, when the human is the agent that provides observations, repeatability, and temporal consistency becomes an issue as it is not trivial to align partially observed trajectories of the observed human with the probabilistic model, particularly online and under occlusions. Since the goal of the human movement is unknown, it is difficult to estimate the progress or phase of the movement. We approach this problem by testing many sampled hypotheses of his/her movement speed online. This usually allows us to recognize the human action and generate the appropriate robot trajectory. The video shows some of the benefits of estimating phases for faster robot reactions. It also shows the interesting case when the robot tries to predict the human motion too early, therefore leading to some awkward/erroneous coordination. Details can be found in this paper. Gaussians allow us to compute things easily. The use of Gaussians to represent Interaction ProMPs means that human-robot movements correlate linearly. Empirically we tested that this assumption actually holds locally, but they do not allow us to create a single interaction model that has global coverage of the state-space. Moreover, as a single Interaction ProMP only represents one task, multiple tasks require multiple Interaction ProMPs trained independently. Here we propose a mixture of interaction primitives where tasks are learned from unlabeled data, in an unsupervised fashion. Referring to the figure below, during the training, the algorithm receives unlabeled weights of several demonstrations and improves the estimates of the parameters that describe multiple human-robot collaborative tasks. 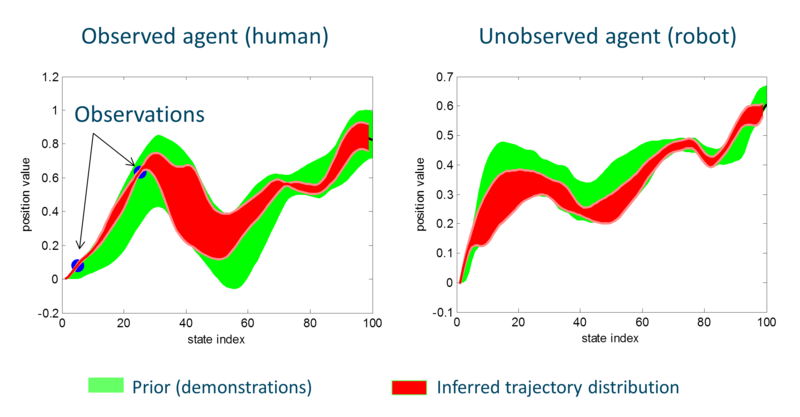 During inference, the method generates a posterior distribution of trajectories conditioned on the most probable mixture component with respect to the current observation of the human. Details of the work can be found here. This video shows a robot coworker helping a human assembling a toolbox. Differently from our previous video, here the tasks are learned from unlabeled data, in an unsupervised fashion. We introduce the use of a mixture of Interaction Probabilistic Movement Primitives. You can read the paper here. and get the code here. Interactive Reaching Task and Toolbox Assembly. This video shows how kinesthetic teach-in is used to obtain pairs of human-robot trajectories, which are then used as training data for the realization of Interaction Probabilistic Movement Primitives. It also shows a practical application of the method where the robot is used as a coworker to help a human assembling a toolbox. In this case the different collaborative tasks have been previously hand-labeled and the interaction primitives were learned independent from each other. This video shows our robot being used as a caregiver assistive robot. The algorithm is based on Interaction Probabilistic Movement Primitives. Details of the algorithm can be found in this work. This code in Matlab shows a simple toy problem example where an observed agent with two degrees-of-freedom (DoF) is trained together with an unobserved agent, also with two DoFs. The observed agent could be the human, and the unobserved agent the robot. Note that to collect training data we assume both agents are observed. This means that we will learn the initial distribution by demonstrations. Once the model is learned (the green patch in the figure), we can observe only the human (the two blue dots) to find out a posterior distribution (the red patch), which can be used to control a robot. The code can be found here here, and the original paper is here. 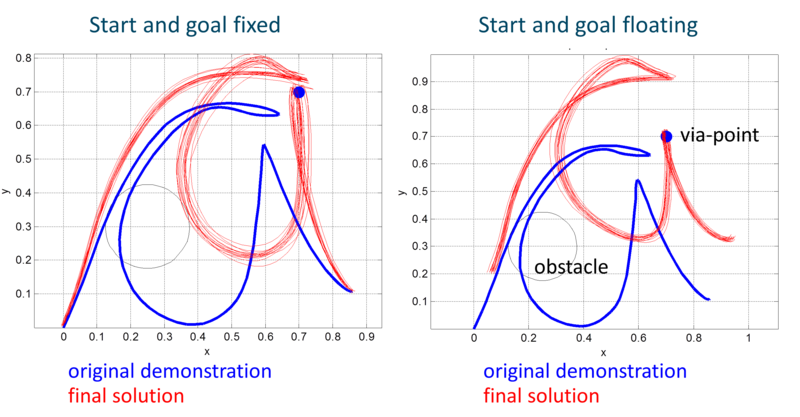 This is a minimalist code in Matlab that uses stochastic optimization for motion planning. It is inspired by a few methods: it uses the exploration of parameters proposed in STOMP, with code based on the Pi2 implementation and the efficiency of REPS as a stochastic optimizer. Despite the code being inspired by different methods, I tried to make its structure as simple as possible. Part of it is because it does not need the DMPs of Pi2 (as in STOMP), and because the episodic version of REPS can be implemented in a few lines of code. Perhaps, the main advantage is the fact that you do not need gradients, and the method works even when the cost is badly behaved, with plateaus and discontinuities. The code that you can find here will run in two different modes. In the first run, the start and goal states are anchored. In the second run, the start and goal are free to float, which allows the solution to preserve more of the original starting shape. Although the latter may sound a bit weird condition (why do you want start/goal to float?) it can be useful to solve the problem described in this paper (which you can also cite if you use the code).